Mimi Batin-van Rooyen, M.D., is a graduate of La Sierra University and Loma Linda University School of Medicine. She completed her residency at St. Mary’s Medical Center in San Francisco, CA followed by a fellowship in Orthopedic Trauma at Cedars Sinai Medical Center in Los Angeles, CA. Dr. Batin-van Rooyen is Board Certified in orthopedic surgery. 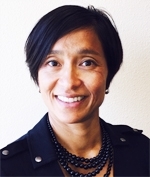 She is currently serving as Medical Director of Orthopedic Trauma Services at Marian Medical Center in Santa Maria. She travels extensively as a medical missionary.